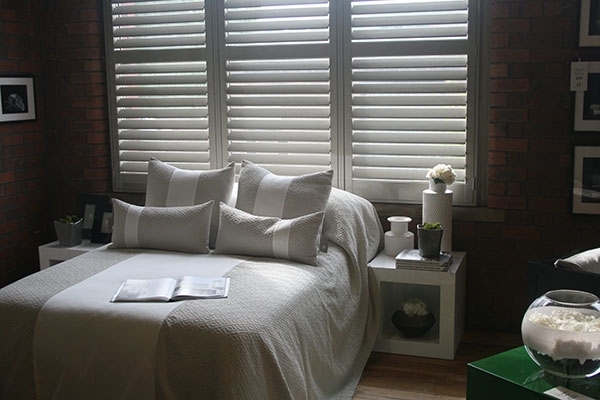 Using plantation shutters to help create the perfect relaxing bedroom, optimised for the best possible night sleep. One of the issues of the modern world we all have to deal with, is how to fit in enough sleep – between work, home care and socialising there just never seems enough time. While we can’t help you clean the dishes or go your with your friends for dinner (unless we’re invited of course?) we can certainly help you create a bedroom perfect for getting a good night sleep. It’s known that optimum sleep occurs when your room is at its darkest. In fact even the period before you sleep should be treated with just as much regard. When you’re getting ready for bed, close the shutters and any major overhead lights. Stick with a small bedside lamp and if possible stay off your smartphone/tablet/laptop! Our customers tend to stick with our privacy shutters in bedrooms as the interlocking panels can close completely flush for nearly blackout shutters. This gives the ability to control your bedroom lighting in the day by angling the shutter slats for different levels of natural light, depending on the mood. Of course if you do not need the ability to angle louvered shutters, you could go for a more traditional solid panel – certainly matched to Victorian homes in the South East of England. Large Victorian homes in East Sussex tend to go back to their routes, reinstalling elm solid panels back in to the tall sash bay windows.